February has been a big month of reading and, in particular, of fiction, which is something I thought would happen (as mentioned in my January monthly reading review) after rekindling my love of fiction last month. 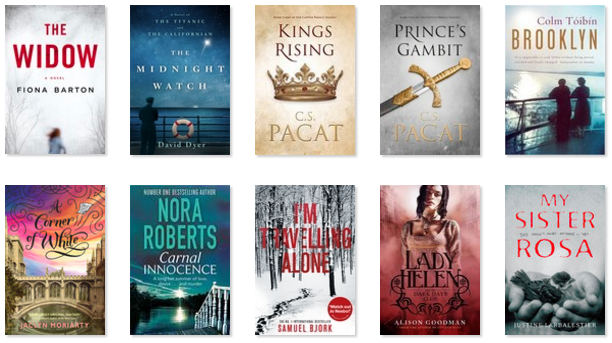 One of my February goals was to read ten books, and it’s a goal I achieved. It’s been a long time since I’ve managed to knock over ten books in a single month and I’m ridiculously happy with that effort. It also felt really great to binge-read a couple of the books below. Perhaps that’s one of the reasons why my goal to blog every day in February fell apart, but there were a couple of books I read in February that I couldn’t help but become addicted to. What were the books I read? Let’s go through them! My Sister Rosa by Justine Larbalestier. This was a deeply unsettling book. While I didn’t love it completely because, honestly, it made me feel a bit old, Rosa is one of the most terrifying antagonists I’ve read in a while. She’s the perfect psychopath, and Larbalestier wrote her in such a way that I was on the edge of my seat until I read the final word. Even once finishing the book, Rosa stayed with me for a couple of days. She seems to have that effect on most readers. Lady Helen and the Dark Days Club by Alison Goodman. I struggled with the first two-thirds of this book. At the 100-page mark I was convinced that nothing of substance had actually happened, and it wasn’t until the last 100 pages of the book that I became truly invested in the book. I’m not sure whether I’ll continue with the series, but I can sort of understand why this book has been so popular. Sort of. I’m Travelling Alone by Samuel Bjork (audiobook). This was such a joy to listen to. I wrote a full review of it, which you can find here. Carnal Innocence by Nora Roberts. Nora is my queen (I wrote a love letter to her, of course) and I enjoyed this book immensely. It was originally published in the early 90s and the overall lack of technology helped enhance the story greatly. In fact, I don’t think it would have been the same book with the presence of technology. It wasn’t ground-breaking Nora, but it ticked all my Nora boxes and I can’t ask for more than that. A Corner of White by Jaclyn Moriarty. I was blown away by this book. Jaclyn Moriarty has created such a rich, detailed, and original world and reading her stories is a privilege as a reader. This was the first book in a YA fantasy trilogy and I expect both the second and third books will appear in my March reading review. Brooklyn by Colm Toibin. This book hit me with so many feelings. As someone who has felt torn between two places (albeit not with a vast body of water between them) while simultaneously feeling like I belong in both places, there are moments in Brooklyn when Eilis’s palpable pain is something I can entirely understand. I really must see this film. Prince’s Gambit by C.S. Pacat. I was warned that this book ended on a massive cliffhanger, so I patiently waited (for 12 whole months) to pick up this book until I knew I had access to the third. I read this in about two days and it’s easily the strongest ‘second book in a trilogy’ book that I’ve ever read. Wow. And I can 100% confirm that the cliffhanger is brutal, so definitely read this with the third book nearby. Kings Rising by C.S. Pacat. I read this in a day. It took over my life, and there are still moments a week later where I get sucked back into Pacat’s world. In the podcast I recorded with Cat last week, we discussed the levels of complexity in the novel and I asked if she knew where the series was heading when she began writing, or if it evolved organically. She said that when she started writing the series many years ago she had the final scenes already mapped out, and she worked backwards from that. If that doesn’t make her one of the most exceptional Australian authors currently writing, I don’t know what does. Read this series. Just read it. The Midnight Watch by David Dyer. David Dyer has written a truly extraordinary historical novel with the story of the ship that could have saved the Titanic‘s passengers. Yep, you read that right. This is a fictional account, based on extensive historical research and true events, of the fateful decisions that led the Californian to ignore the Titanic‘s distress rockets and not rush to its aid. Dyer handles the sensitive nature of this subject material with the gentle had of an experienced author, which makes the fact that this is his debut novel all the more remarkable. The Widow by Fiona Barton (audiobook). Ugh. This story had so much promise. It was a good idea that was executed poorly based on the multiple viewpoints and timelines that jumped all over the place. In one of the opening chapters, the reader learns that one of the main suspects in a child abduction case is actually dead, and I instantly cared less about them. That’s not what should happen in a good thriller. That’s it for February! Did you read any particularly good books this month? Let me know below.